Here is another video from the series Perils for Pedestrians. This video focuses on what is happening in Seattle. While Seattle is known for some of its nice walkable neighborhoods, there is other parts of Seattle that are not very pedestrian friendly and there is discussion on how to change that. There is some good information on how things developed and what we can do to change them. Once again we are at a disadvantage along the Wasatch Front when you have to deal with so many different planning organizations to get anything done. Image via WikipediaWhen the announcement came that the Cottonwood Mall would be torn down and replaced by a new development, I was skeptical of how the development would be developed. It look as though General Growth properties basically let the mall die so they could turn around and redevelop and get tax dollars for the development (along with the tax savings they get by building a new development over a remodel). Well I have kept an open mind that they would do something different, to set it apart from Gateway and blend the development into the rest of the community. We have seen way too many developments like Gateway that are designed to keep people within the complex and do not blend into the rest of the neighborhoods. Today, I was asked to fill out a survey about what features I would look for if I were to purchase a home in the complex. First of all, in this age of high priced gas, there was no question in the survey about how important transit connections were so I included comments about that in the survey. While it is too early to see how the development will blend into the community, it looks as though it will be another Gateway were it is easy to move around the development but you will be discouraged from leaving the area. The creek looks like it is designed to be a barrier to people heading to Highland drive. The sidewalks to cross the the creek are very narrow as to discourage people to walk across them. While General Growth also said that it would like to invite locally owned stores to locate in the center, they made it clear that it would have to be an additional location for a successful high end location. I do not expect the city of Holladay to do much to insure that the complex is blended into the community since they have show little in the way of good planning sense so far. Clearly this complex is designed for the Lexus and Mercedes crowd and not the UTA riding crowd even if those riders have given up their Lexus to take the bus. New developments such as the one at the Cottonwood Mall need to be encouraged to blend better into the neighborhood, encourage transit access, and also consider some affordable units to give a better mix of housing options. While some developers see making the complex blend into the community as a bad thing because that encourages people to leave and go to other neighborhood stores, in the long run it will bring more people to the area because it will actually encourage more shoppers to the area because there is a wider range of shopping options. AC Transit is canceling its latest order for Van Hool transit buses after rider complaints about safety and other issues. These are the same type of buses that UTA has ordered for the MAX service along 3500 South. The problem with having a separate fleet of buses is that you have to have a special parts inventory especially for non-standardized buses like the Van Hool's. Plus they have been a maintenance nightmare for other transit systems. UTA would have been farther ahead to order more Gillig's despite their issues and just paint them a special color and order the wider back doors. Most of the plan looks pretty good. I do question allowing bicycles back on the sidewalks except for a limited distance simple because it will endanger pedestrians and we need to make Salt Lake more pedestrian friendly besides more bicycle friendly. Also if they are going to do the circular buses incorporate the 500 Capital as part of the system and then eliminate the fare free zone. Let the buses (and eventually streetcars) handle the short distance riders freeing TRAX for the longer distance rides. Next there is some minor articles such as UTA appointing a new board of trustees, a plan to mitigate wetlands damage during TRAX construction, and the story of two sisters protesting gas prices. Image via WikipediaFor the second time in less than 7 years we are caught with our pants down. First it was September 11th when our airline system came to a halt and now with high fuel prices hurting the airline industry and driving. Today we have little alternative to those two modes since our rail passenger system is a joke. You would have thought we might have learned something after Sept. 11th but it looks like we have not. Just like then our rail passenger system is a joke. It is made worse by many issues within our national rail passenger carrier Amtrak. While rail passenger service will never replace automobile travel or airlines, what is important is to have an effective rail passenger service as an alternative to the two. I am not talking high speed trains here as they are impractical but an effective network of long distance and short distance trains that would allow more convenient travel across the country. In the past year I have ridden several passengers trains run by Amtrak including the California Zephyr from Salt Lake City to both Reno and Denver, the Coast Starlight from Los Angeles to Portland, the Cascades Talgo service from Portland to Seattle and finally the Empire Builder from Seattle to Spokane. While the crews have been hit and miss, overall the experience has been wonderful. While on the train I can do some computer, enjoy the scenery since I am not driving, and relax in a way I cannot do any other time. Amtrak but in spite of it in most cases. Amtrak on the other hand seems to only care about taking money from the states. Despite record ridership Amtrak is not pursing expanding routes or buying much need new equipment except in the northeast corridor. Utah's only work on rail passenger service has been a proposed high speed train from Logan down to Cedar City which seems like a wasted effort at the present time. It would seem that a better strategy would be to work on rail passenger projects with neighboring states that will improve both rail and freight passenger service. We are slowly seeing the development happen that has accompanied many light rail lines including such cities as Los Angeles and Portland. We are also seeing new Transit Oriented Developments being built in Sandy and Murray with more to come. Clearly we cannot sustain the auto centric developments of the last 70 years. We need to focus more on making our cities more livable. It is clear from the success of Daybreak that people will go to neighborhoods that are pedestrian and bicycle friendly and although it only has limited transit service now, will have TRAX service very shortly along with community shuttles. There will be even more opportunities for sustainable development once our new TRAX and Front Runner stations come online. I have already pointed out other opportunities to design new developments that is affordable to the lower end of the economic scale. . Image via WikipediaHere is the latest article on the BRT project in Orem/Provo area. According to the article the current 830 line attracts 3000 riders per day but the BRT is supposed to carry 13,000 to 15,000 riders. I just don't see that happening. Anyone who rides the 830 route will know that most of the riders are heading to local stops along the way especially 700 East and 1230 North, and 550 West. There is also a large amount of travel from BYU to the Mt. Timp Transit Center. Unfortunately current policy at the Federal Transit Administration supports high ridership numbers for BRT and low ridership numbers for light rail which always makes BRT look better. My worry is that the BRT will not meet ridership potential and that will give cause for all the anti-transit types in the Orem/Provo are to say "see, you got BRT and it failed so you don't need no light rail". If you look at the Busways in Los Angeles and Pittsburgh you will find that they are carrying below to substantially below what they were projected. The Harbor Freeway Bus way in Los Angeles is lucky to get 5,000 riders while a few miles away sits the Blue Line that carries 78,000 passengers per day. Another problem I see with the proposal is the idea of running buses every 5 minutes. Once you get buses running that frequently you start getting problems with buses bunching together and schedule problems. Further you have long term capacity restrictions with BRT. The much touted Orange Line in Los Angeles has hit capacity at 20,000. Metro cannot add more buses and unlike rail you cannot simply add another car to the consist. What will help this line is Front Runner South allowing people to transfer to and from Front Runner to head for such destinations as UVSU and BYU. Of course little progress can be expected out of the Utah Valley area so long as their planning is through MAG which is a rural based organization. The needs of Utah County are very different from the needs of the rest of the MAG area but so long as those rural interest have the say, good planning will be stymied. Well, I missed another ground breaking ceremony. First I missed the ground breaking ceremony for the West Jordan TRAX line because of my anniversary trip which was much more important, then yesterday I missed the ground breaking ceremony because I had business obligations. Oh well I made the important Front Runner Grand Opening and there is still 3 more ground breaking's to go including the Airport line, the Draper line and Front Runner to Utah County. It will be interesting to see what develops at the 2100 South, 1300 South, 900 South, and 500 South stations over the next few years. When all the TRAX lines are up in running those stations are going to have extensive service. While Envision Utah showed some grand plans for the 2100 South area a few years ago little has happened toward that direction except for the mixed used development at 2100 South and Main. With all the new auto centric developments to the west of TRAX, the best hope for good pedestrian friendly development is the east side. With the addition of the Sugarhouse Trolley you could have a nice pedestrian friendly neighborhood that could connect the TRAX line with Sugarhoure. In fact TRAX could become a border from a nice pedestrian friendly area to the east and a sea of concrete to the west. Image via WikipediaHow are we going to make our area more bicycle friendly? The City of Salt Lake is turning 200 South into a more bicycle friendly street but what else is being done to encourage the use of bicycles? After all, much of the valley is pretty flat which makes it perfect bicycling territory, but we still have few facilities for bicycles. I have to admit I have not rode a bicycle since I was in Jr. High School because it just became to dangerous to ride. I was living in Southern California at the time and there was no bike lanes so the bicycle ended up being parked. Recently I did purchase a new bike for recreational riding along the Jordan River Trail. There is few bicycle lanes or other facilities near me so my riding will be limited to the trails. In some European cities bicycles have their own separate area. You will have car lanes to one side, then dedicated bicycle lanes and finally the actual sidewalks. This gives bicycles their own right of way so they are not interfering with automobiles or pedestrians and their right of way is not invaded. The city of Portland is making bike lanes much more noticeable by painting them and then also have large areas at intersections for bicycles to wait. Another area where Salt Lake City could catch up is Bicycle shares. While I was on vacation back in May there was an article about this in one of the local papers. We need to adapt a system such cites of Paris have with bike sharing. There you put in a credit card deposit and then you can rent a bike relatively cheaply for a certain amount of time. There is talk of putting such a facility in at the Central Station but there will need to be more facilities to make the project workable. The wonderful blog Transit Miami often has several previous entries about trying to make their area more bicycle friendly and yesterday had a link to the city of Cambridge that is one of the most bicycle friendly cities in the country. Bicyclist can also help the cause by not doing things like running red lights that only hurt the cause of making the area more bicycle friendly. Image via WikipediaHere is a article from yesterday's Deseret News covering what has been talked about since Front Runner opened and then an article from today's Salt Lake Tribune about art along the TRAX tracks. It looks like everyone in planning Front Runner underestimated how popular the Layton Station could be. Truth be told, the way the Federal Transit Administration's policies work rail ridership always is understated while ridership on BRT lines usually gets overstated showing their prefeence for the latter. Once again part of the problem can be laid directly to the sprawl style development that has taken place in the Layton area. It is very difficult to service the area with conventional bus routes. Eventually the area should be served by the same Call A Ride type vans that we have discussed for areas around the TRAX lines. Of course the short term solution is to build addition parking but land will have to bought to serve that purpose. Eventually the Layton Station would be another excellent location for a transit oriented development. Not only does it have Front Runner, it is served by the 470 and as I stated should eventually be served by Call A Ride vans. Integrate the old train station so the restaurant located there can be the focal point of the development plus additional parking. People would then have the choice to live near the station, or commute to the station plus have a host of entertainment options. It is located right next to the historic Main Street area that could be a great drawing card for the area. The second article which is in today's tribune talks about a grant for artwork along the TRAX lines especially the north-south line. About the only negative of the line is all the graffiti that is along the corridor so replacing it with artwork would be a major improvement. However, the article says that the landowners agree to maintain it for five years so that needs to be enforced because some of the older murals are getting tagged frequently. Article from today's Tribune about UTA going to smart cards. It will be interesting to see how these will play out. The benefit is that they can keep track better of passenger boardings. Bill Tibbets and his gang of yellow shirts, or are they orange? are pushing for the UTA to lower fares in the city. Of course they don't look at the other side of the coin to see if this will produce enough revenue to pay for itself but that is another story. Of course if UTA does lower fares just in the city of Salt Lake, shouldn't the city be the one to pay for it? That also brings to question the whole proposal by the yellow shirts. 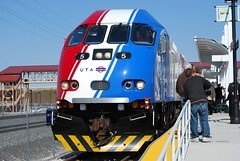 Lets say UTA actually did lower fares just in the city of Salt Lake. Why should someone traveling the same distance pay more because they live in Murray? Of course the people who make these proposals never look beyond the basics to look at the other side of the coin or the unintended consequences of what they propose. 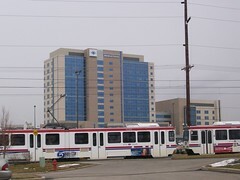 Image via WikipediaWell, we knew it was only a formality, but the city of Salt Lake City and UTA have signed the agreement to allow construction of the Airport TRAX line. The line will operate from downtown via North Temple to the airport. Sadly the westside's inferiority complex was allowed to make a transportation decision so the line will use 400 West instead of making a direct connection to the Intermodal Hub via 600 West. This line will provide a critical link that will allow people to access the airport easier especially with the connection to Front Runner plus make it easier for airport employees to leave their cars at home. Saldy, in this time of high gas prices and problems in the airline industry I cannot say that having a connection to intercity rail passenger service was important since it Amtrak service in Salt Lake is a joke. Salt Lake City will join Portland, San Francisco, Chicago, Philadelphia, Washington DC (BWI and National), Atlanta, Burbank and St. Louis as having rail connections with the airport. LAX in Los Angeles, Miami International and Fort Lauderdale have short shuttle rides to rail transit service. In addition Seattle will be joining the list late next year. Personally I have flown into/out of Burbank, Portland, Miami, and Fort Lauderdale using transit connections and for the most part they have worked well. For example a couple of years ago my wife and I flew into Portland, picked up our luggage walked right to the MAX light rail train, got off at our stop and walked to our motel. Another benefit of using transit from the airports is that you do not have to drive in a strange city. Labels: Downtown Salt Lake, Los Angeles, Los Angeles California, Portland, Salt Lake City, San Francisco, San Francisco California, TRAX, UTA, Utah, Utah Transit Authority, Washington D.C. Yesterday, I had a meeting to attend to in Downtown so I thought it would be a good time to go get some pictures at the Intermodal Hub, Central Station. I started off on the 213 getting one of the 2006 Opus buses which is the perfect bus to be assigned to this route. I then took TRAX to the Intermodal Hub. On my way back I took TRAX to the Stadium Station and onto the 220. I cannot wait until they build something at the Stadium TRAX station. I just hope it has something like a convenience store because yesterday I was getting pretty thirsty waiting for the 220 but of course I would have missed the bus if I had to walk over to stores on 1300 East and 200 South. But then came the 220 with bus 9214 assigned. One of the last of the Orion V buses still on the road for UTA. The bus itself is better than any of the low floor buses built today, but what was really irritating was the wrap. Now anyone who has read my blog for any length of time knows how much I despise wraps but this one was even worse than most. As you can see from the picture you cannot see a thing out the window. This is why I hate wraps so much. Image via WikipediaI miss the apartment I was living a few years ago. From my apartment I could walk to a local grocery store, a pizza parlor, Circle K, a hardware store, dry cleaners, postal service annex and a newstand that had a couple of really cute girls employed. I could also catch the bus from in front of the complex to the main downtown area which in this town was called "uptown" to give it a little better name. This complex was not designed as a transit oriented development but it worked much the same way. Everything was designed to be in walking distance including transit service. I am not talking about Portland, Oregon; Seattle, Washington; or San Francisco, California; New York City; or any of those northeastern towns. The city I was living in at the time was Charlotte, North Carolina. While I could not use the bus service for regular transportation since it most of the routes radiated out of uptown area and provided generally poor service (you couldn't even blame light rail for this one since Charlotte just opened their first light rail line early this year). In addition I was working for Oldsmobile in the racing arena at the time and transit just didn't fit the needs although I would have used it if it worked. What did work was my wonderful apartment. The convenience of not having to get in the car to go to the grocery store or run everyday errands. That is the essential elements of Transit Oriented Development. Today in many cities around the nation you can live near a light rail or bus station, have all your services convenient to you, and not only be able to run your errands without using the automobile but also have the luxury of hopping transit to work, dinner, a movie, or a many other activities. They exist in Portland, Seattle, San Francisco, San Jose, Denver, and of course the older transit cities such as Chicago, New York, Boston and Toronto. Monday's development conference hopefully will spawn some developments here in Salt Lake City. I have already talked about some actions that can be taken along the major bus routes that will help out with not only providing affordable housing but increase bus ridership by making bus service more convenient. We have already seen a new vision come out of the University of Utah and hopefully we will see many more in the next couple of years. We need housing and services to become more convenient to each other were walking and transit become easy options, not something that is an afterthought. Image via WikipediaArticle in the Trib today about plans of the University of Utah to turn itself into a more pedestrian friendly campus. Plans include replacing much of the surface parking with parking garages and concentrating development along the TRAX lines. The University should be applauded for its efforts over the years to encourage its students to take TRAX and the bus. While Universities much like airports gain revenue from parking which many times will cloud their judgment when it comes to promoting transit service, it is clear that the U of U has seen that transit plays an important role in moving its students. The boldest part of the plan is to replace the parking lot between the Stadium TRAX station and the Stadium itself with a huge mixed used complex that will include residential, office, retail, restaurants and entertainment. Not only will this benefit students at the U, it will also help those of use who transfer from TRAX to buses at that location. I often transfer from TRAX to the 213 or 220 and it will be nice to be able to do something while waiting for the bus or TRAX. You add the streetcar from my earlier proposal and you have a major entertainment destination. I hope that the University will encourage locally owned businesses to be a major part of this complex and doesn't give into chain phobia. Another outstanding part of the plan is to replace temporary buildings near the Fort Douglas TRAX stop and replace them with new housing. This will put students directly on the TRAX line and allow them easy access to downtown shopping and entertainment and further reduce the need for the automobile. By the way lets put some basic economics here. These developments will encourage transit use, not only TRAX but also the bus. It will encourage more people to ride them thus creating more revenue, revenue that then could be used to improve the bus system. As I have stated, the present problem is not the management at UTA, it is the fact that it is hard to take the bus in the Salt Lake Valley and once again not because of the route structure but because our streets, sidewalks and developments do not encourage transit use. Heck, as I have stated a million times, here we are in the 21st Century and when it is dark you need a flash light to flag down a bus do to the lack of streetlights. We have problems in Salt Lake, but the problems isn't were some misguided people think they are. Developers getting to many breaks? Craig Mecham's development in Sugarhouse was controversial to start out with. Taking an area with unique character and bull dozing it to build another gentrified development of chain stores and no character. Now instead of have a unique blend of eclectic shops, we have a big hole in the ground and very little progress being made. As I have pointed out on several occasions, the Salt Lake City Council and planners seem to give into whatever the developers or big chain stores want no matter the determent to the community. So now we have what was a pedestrian friendly, home to locally owned stores neighborhood that has been torn up and once something actually gets built with be auto centric and not have the feeling the neighborhood once did. The city council and the planning commission should be working toward building more pedestrian, transit friendly areas. They talk good about them but when all is said and done the city of Salt Lake gets a big F when it comes to acting. Its time to stop giving too many breaks to developers. Apparently the bus riders union is getting desperate. Having lost its bid to stop the fuel tax surcharge, now it is attacking light rail head on posting an article by Randal O'Toole describing how Light Rail is a failure. I have spent the last few hours deciding if I should even bother with this, but considering the bus riders union is trying to pass off this misinformation campaign I decided I should go over the facts. O' Toole has long been a apposed to transit, especially rail transit and uses the fact that he is a foamer to qualify himself as an expert. For those who don't know the term foamer it is used to describe rabid railfans, the types you see carrying the scanners and in general wearing shirts and hats from current or dead railroads. So lets go over what O' Toole claims and go over some facts. 1. His first point is that Light Rail Cost tax dollars to build. Well yes, it does cost money to build but so does any infrastructure project. How many billions will go to the new Mountainview Corridor highway? However, clearly the taxpayers of the counties affected have seen the benefits of the projects and support them. 2. Light Rail does not get people out of cars. Here is another illustration using Los Angeles, the Blue Line between Los Angeles and Long Beach is now carrying upwards of 80,000 people per day (while a nearby busway carries 5,000). If you were to replace that line with buses you would have to run articulated buses with crush loads every 60 to 120 seconds to carry the numbers that the Blue Line is carrying. The Blue line replaced an express bus (that originally replaced the red car interurbans), that ran every 20 to 30 minutes and only carried a few thousand passengers a day plus a local route that carried even less. Light rail does attract those out of cars. 3. Light Rail can inconvenience riders. O' Toole tries to claim that transit systems that put in light rail lines loose overall ridership. Clearly this is not true as ridership on UTA has gone up substantially. Even a better indicator is that revenue has gone up consistently since TRAX has gone into service. Yes some people have to transfer who didn't previously, but overall service is improved. Also, the problem with buses being cut isn't the cost of light rail since it cost less per passenger than buses, its that there is not enough people riding the current bus system with shows other issues besides the light rail. 4. Light Rail increases congestion. Apparently because lights are timed for light rail trains it increases congestion. However, if you were running BRT, then you would have buses holding signals so wouldn't that increase congestion also? Also the lack of light rail would put more buses in the downtown region so that would also create more congestion. In other words we are grasping at straws here. 5. Light Rail benefits Downtown Property Owners at the expense of others elsewhere. O' Toole uses one study to say that money is repositioned to downtown thanks to Light Rail. Could it be that people are more likely to come to downtown when they don't have to deal with traffic and parking issues. Personally, I only went downtown once or twice in the two years before TRAX started but after it started running I would go downtown much more frequently because the parking and traffic hassles were history. 6. Light Rail Does not stimulate local economic development. More nonsense from O'Toole here. He claims that the only economic development is created by taxpayer subsidies to developers. Of course you will never here O' Toole mention the subsidies that go to big box retailers and other developments that are not transit related since they are apparently OK.
7. Light Rail Increases Energy Consumption And Greenhouse gases. Here he attacks the TRAX directly saying because of TRAX buses are running empty causing energy consumption to go up. Then he says that bus ridership in Salt Lake went down 50% when TRAX started although the truth is bus ridership has remained relatively flat for 15 years. Of course there was areas that were loosing riders namely the Ogden area and Provo/Orem but the last time I checked TRAX did not go into those areas. 8. Light Rail diverts tax dollars that could go to more worthy transportation projects. Here is were O'Toole and the BUS riders union shows its true colors. He states that money should be going to highways that buses could use and not rail transit. Apparently he believes the voters of Utah and other areas are stupid because they support transit. We already know that the BUS riders union will seek the support of those who want to steel the TRAX funds to support highways and this is even more proof. I would urge everyone to go comment on the Bus Riders Union blog entry and tell them how you feel. Here is another episode of Perils for Pedestrians. This one talks about what is happening in Washington DC including the on again off again Purple Light Rail Line. There is also a discussion with a representative from a county planning organization that covers the county that includes Charleston, South Carolina. One of the problems we face here in Salt Lake City is the lack of a metropolitan planning organization that provides more cohesive planning than the wide range of city planning agencies we currently have. While we do have the Wasatch Front Regional Council, it is not a primary planning organization for the area. Finally there is an interview with a traffic engineer that gives some explanation on how pedestrian signals are timed and some of the terms used. Salt Lake City Anti-Small Business? Image via WikipediaA recent comment about the pedicabs got those wheels turning again. The question is, despite the existing of a couple of organizations to promote local business including Vest Pocket and Buy Local First Utah, is Salt Lake City anti-small business? Lets take a look at the Smith's at 900 East and 2100 South in Sugarhouse. As regular readers of this blog know, I often hold this as example of giving into the blackmail of a big business and not sticking to plans and the neighborhood. The question is, if that had been a small grocery store would have Salt Lake City given in or would they have stood their ground? If they would have stood their ground that means that they would have discriminated against the smaller business. We also have the example of Wal-Mart at 300 West and 1300 South which in is a community with a high percentage of non-car owners. The store is designed for people to drive in and out of and pedestrians (especially those coming from TRAX) have to risk their lives to reach the store as the driveways are high speed routes for drivers and pedestrians have to use them to reach the store. Another example of this is the food carts that have populated the downtown area. It seems like some bigger businesses (for example the Taco Time at 8th south and State) don't like the competition from the smaller carts and have been pushing for regulations against them including ones that have recently passed. Some even try to demonize they carts by giving names link with food created diseases. I find this kind of ironic considering I have never had a problem eating food from one of the these carts but have gotten sick after eating from major restaurant chains. Now instead of trying to regulate these carts out of business, how about supporting the small entrepreneurs and encourage them so long as they pass health regulations? I noticed in Denver the food carts were nicely integrated into the 16th Street Transit Mall. If anything Salt Lake City should be promoting small business more. It is ironic that cities such as Salt Lake, Sandy and others work so hard to attract big box retailers and other chain stores when it reality they end up cost more than they bring in. According to studies done the cost of police, fire and other city services cost more than what sales tax dollars come in. That doesn't even take into consideration all the hidden cost of big box retailers such as infrastructure cost such as the 80 million that now has to be spent in Springville since people don't notice those kind of things. The ultimate irony is the fact that small business contribute more to the local economy, actually pay higher wages on average, create more sales tax dollars per square foot of space, do not increase cost of city services, are generally safer, and fit better into the fabric of the community. Salt Lake City should working harder to help small businesses and build a comprehensive plan that includes transportation, planning and the promotion of small business.